This post is a little follow up to my last A/W haul (which mostly featured Primark!). I decided to hit the shops again last Sunday to buy a few more pieces to add to my work wardrobe -- I wasn't really sure how smart I needed to dress but I decided to buy things I'd wear out of work too. These two knits are from Primark -- the cardigan is in the same style as a jumper I featured in my last haul, and the houndstooth jumper was just a 'couldn't say no' item to wear with a collared shirt underneath. 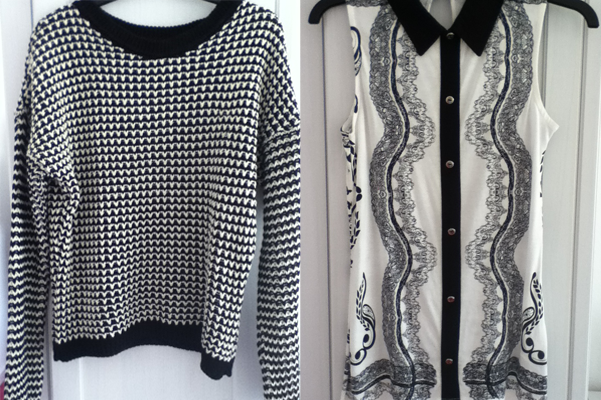 They're both ridiculously good quality -- I would really recommend checking out Primark's knitwear for this winter! 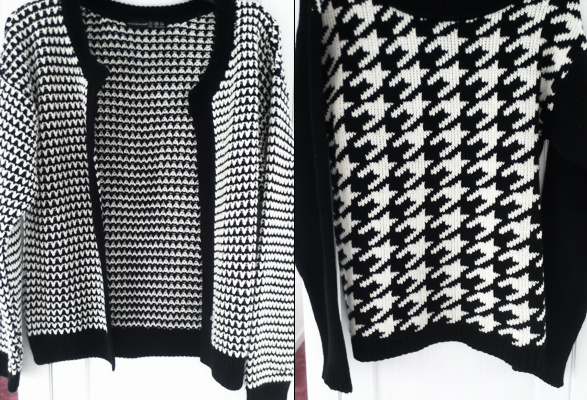 The blouse on the left is from H&M, which I will team with the houndstooth jumper! The sequined/broderie collar stole my heart. I did buy this in a small, but the width of the blouse is slightly too big for me.... I generally wear this with a high-waisted skirt but the top overhangs a little more than it should. Still very happy with this purchase though! 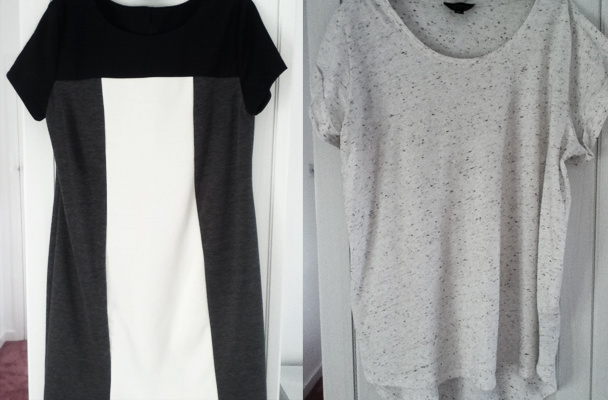 On the right is the Zara dupe blouse that I have been waiting aaages for. I found it going for less than half the price of the Zara one, over on the SheInside website, and I used a discount code too (AND it came with free delivery!). I had a slight issue with this shirt upon arrival as it had a black mark on the front of it... I'm desperately going to try and scrub this off but the people over at 'SI' kindly offered me a coupon as a sorry gesture. I don't think I have bought anything from BHS in the last six years.. but when I went into their shop last weekend, I found so many pretty clothes I wanted for work! I ended up getting this shift dress (which has a very 'sixties' feel to it) to team with tights and flatforms. I'm still yet to wear this for work! Lastly, this was my absolute faaavourite A/W buy from both hauls! I sadly couldn't take a good photo of this.. all of the photos on my camera decided to completely fade out the pearls if I did a full shot of the item. The top is actually the same style as the other H&M tee in this post, just with a pearl collar instead. I've already worn this twice for work, the collar detail is so beautiful! I have to say, Primark are doing really well with their A/W clothing range -- the prices have gone up slightly but the quality of their clothing also seems to have gone up with this. I fell in love with this jumper last week and just HAD to buy it. I love anything 'Houndstooth' and thought this looked a bit like it. In my last outfit post, I featured a knitted jumper from Topshop, and I actually think that this Primark knit is a much more flattering fit -- it's still quite oversized but it compliments your body shape much better. It's very warm, and for £12 (less than HALF the cost of the Topshop jumper!) it's a really great buy for the winter! Oops, more Houndstooth with this peplum top! I was really happy to find this in Primark -- I personally normally like my work tops and blouses to be long-sleeved (it also means you don't have to fret too much about what cardi or blazer to throw on with your outfit) so I was pleased that this had slight sleeves to it. I'm going to be wear this with my trusty black H&M bodycon skirt, with the peplum edge giving me a bit of shape. Similarly, I will be wearing this floral/paisley printed peplum top to give me some shape -- this one will need a little bit of extra thought with the jacket though! 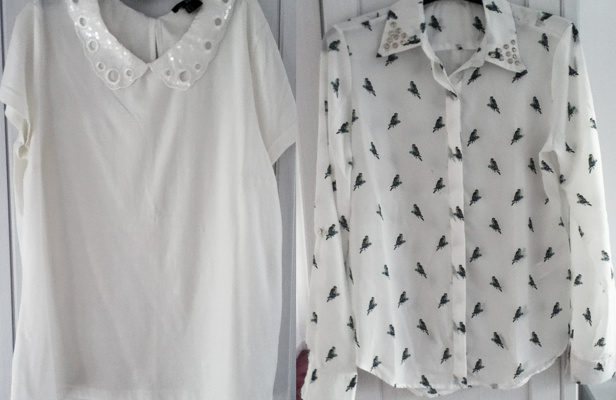 Again, I think that both of these tops were £7 or £8 and they are both from Primark. I'm really sorry if you're not a peplum fan! 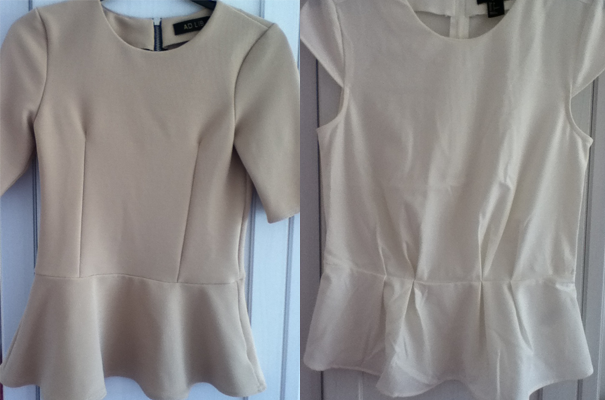 It's virtually impossible to get tops in the highstreet stores at the moment that aren't peplum. I ended up opting for so much of this style, because the only other alternative was sheer blouses -- I cannot stand the sheer trend. The thought of wearing a sheer blouse just makes me feel uncomfortable and I don't want to have my bra or strappy top on show. Sadly, the sheer blouses all have such gorgeous prints on them, but I can't wait for thicker blouses to come back into fashion. 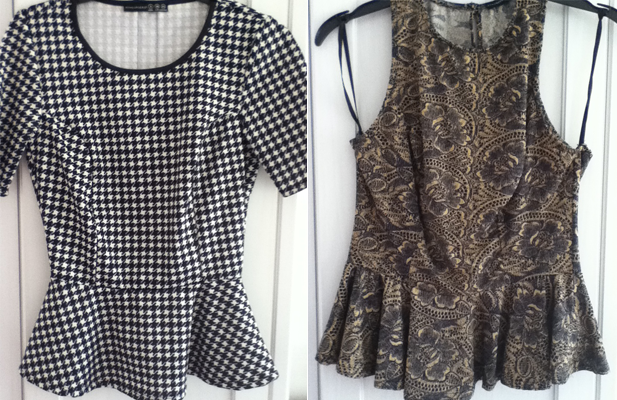 These final two peplum tops are from Lavish Alice (left) and H&M (right). I was really impressed with the Lavish Alice one! It was actually only £10 in their sale.. and it's gorgeous! It's made from a pretty thick, stretchy fabric so it can be worn on it's own with a skirt/leggings/trousers for work. The H&M top cost me £12.99 and it is a lot thinner, but I will team this up with a coloured blazer, leggings and my black Office flatforms most likely! These are my two favourite buys from the past two weeks -- the Zara-dupe bag from Primark (only £12!) and my carboot sale Essie buy (£1). The Primark bag came in both black and tan but I always, always opt for a brown bag, so here we go! And the Essie nail varnish, 'Mink Muffs', was actually the only thing I came away with from the carboot sale but I adore it. The colour looks like chocolate on your nails and it's very on-trend for this winter! Have you been prepping for Winter?